BUSKRO is pleased to introduce a newly redesigned family of Apollo print heads. Based on HP’s proven and reliable TIJ 2.5 platform, the new BK2600 (2” @ 600 DPI) and BK4600 (4” @ 600 DPI) Apollo heads feature a simplified head and bridge design along with a fully re-engineered HP Interface Board V2 (HPI). The new HPI board supports up to 4 TIJ 2.5 pens for a total vertical print coverage of 2” of print replacing two of the older-style HPIB boards capable of 2 pen-support each. 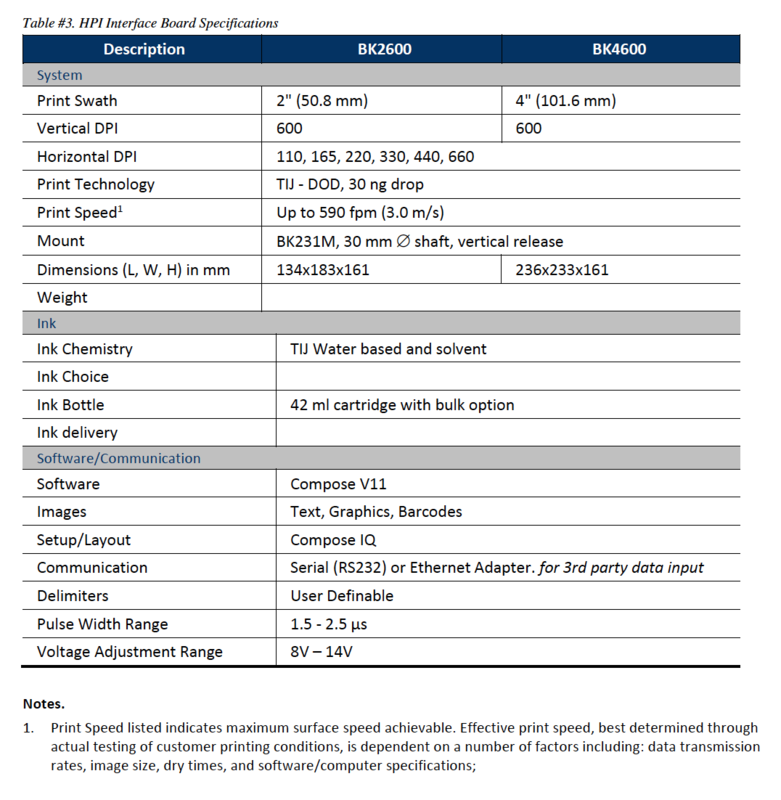 It also incorporates adjustments for both the pulse width and voltage level making it more suitable for HP TIJ 2.5 solvent and other boutique inks that require tuning of such parameters to optimize print performance. Although the HPI is fully backward compatible with older versions of Buskro’s powerful Compose IQ software, customers wanting to take advantage of the tuning features will require Compose V11. Apollo head can be used in conjunction with any other Buskro print head, print technology or ink type. Buskro’s Apollo print heads fully integrate with our industry-leading Compose IQ software making it perfect for all applications from simple printing, marking and coding up to more complex applications where matched printing, product tracking and print verification are required. To provide our customers with an opportunity to take full advantage of the new features of the HPI II board and/or replace their existing HPI board(s), Buskro is offering the following: With the proof of purchase of one or more HPI board(s) (PN 9109380) to replace existing HPI board(s) by the Deadline, Buskro will extend a fifty percent (50%) discount on the purchase of a single version (UBK-CIQ-SV) or multi version (UBK-CIQ-MV) Compose V11 software upgrade as required for the associated Apollo inkjet system. Please contact Buskro at [email protected] or 905.421.3401 for additional information. 5. Discount is offered on the software license only, additional hardware may be required; please contact a Buskro sales or service representative for a full upgrade quotation. 9. To add a BK7IB Transport base to any of the listed stand-alone Apollo packages as shown in Table #2, add $14,000 MSRP (in USD). Applicable dealer discount = 25%. No additional SID applies; SID = 0%. BK7IB is fully CE approved. Please note MSRP up-charge for BK7IB from BK76IB is $4,800;In the event a transport base is included in the purchase, the required line items to specify a complete system excluding any ancillary items (see #5 ) are as follows: (i) Apollo Print package (See #1), (ii) Transport base, (iii) interconnect cable, and (iv) transport base country kit.